Only FIVE MORE OFFICIAL DAYS OF SCHOOL! so we spent most of it outside! TONS of bike riding was done, because now there are two children in our house who don't have training wheels. We rode in the cul-de-sac to perfect our skills. I guess you could call this PE, but whatever it was, the children had FUN and were worn out every day! In the middle of the week we took a long nature hike. Using Crinkleroot's Guide To Knowing The Trees, we identified different Deciduous trees and Conifers, too. If you would like a basic guide to trees, this is a wonderful reference. I had been wanting to do this with the children for quite a while, because my knowledge of this was quite weak, until we studied it together! There was a quiet pavilion by the lake where we collected leaves and identified them. We saw two woodpeckers on a tree very close to us, and in the lake we saw lots of turtles and huge frogs. We tried to take note of all the interesting things we saw on our walk... this log with everything growing out of it won the prize. No trip to this particular nature area would be complete without finding the "Mule's Head" carved into the rock... we had to stop here for a little snack. On Wednesday we made a dinner for a family who had lost a loved one in the recent tornadoes. The kids requested I make Crunchy Jumble cookies as the dessert (with their assistance, of course). We delivered the meal and were glad to do something (if ever so small) to help storm victims. We need to find ways to do more. We are almost finished reading Black Ships Before Troy: The Story of the Iliad... thankfully I had found these great character cards to go with the story. I printed and laminated two sets, so as I'm reading aloud, the kids pull out the characters involved. It cemented many parts of the story, and helped keep the many characters straight in their minds. Since we have two sets they can also play Concentration with the character cards! They are LOVING history right now. The week was culminated with a FIVE MILE bike ride around a local lake... I could not believe they went this far (especially my six year old), but with his sister cheering him on, he did it! I had to take quick video of them at the very end. As I was walking and watching them I had one of those moments where I just KNEW homeschooling is the right thing for us. The children are growing so close to each other and I feel like we're living these precious years to their fullest. Other accomplishments included GMan finishing his Horizons First Grade math book! Second Grade will be here soon and he's ready to go. Miss B is so close finishing Easy Grammar 4 - grammar is her favorite subject and we will continue with Easy Grammar 5 next year. Miss B's piano recital is tonight and she has been practicing her heart out. I can't wait to hear her, plus she is receiving a special award for three years of superior performances at the piano festival. We read (in just two sittings! 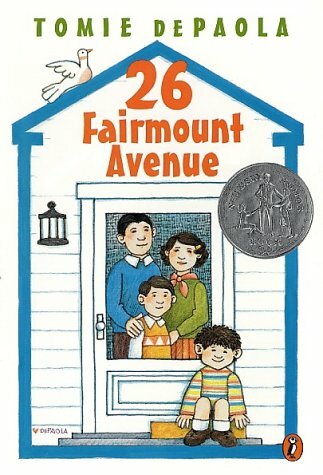 ), 26 Fairmount Avenue, by Tomie de Paola. What a great book! I ordered the next two in the series because we loved the first so much. It was the kind of book that made us laugh out loud. In case you didn't enter the giveaway yesterday, it is a fabulous $65 subscription to Storyvalues Interactive. Read the post here and enter to win - ends 8 p.m. Friday, May 6! I'm also linking up with Jen at Forever, For Always No Matter What!